For Lisa Suda, SPA/BA '11, a public policy specialist, the decision to attend American University was an easy one given the politically active nature of the school. As she puts it, "After visiting and seeing the campus, I applied early decision and the rest is history." What Lisa didn't yet know was that on August 18, 2009, while recruiting cheerleaders for the AU spirit squad, she would meet transfer student Justin Berger, CAS/BA '11, who would not only join the squad, but become her AU sweetheart – and future husband. My first impression of him was "I'm sold," Lisa remembers. "He looked me straight in the eyes - to be fair, he looks everyone in the eyes – and when he walked away I told the other girls, 'I have dibs!'" During their time at AU, the two not only grew individually, but also as a couple, navigating DC life. Lisa grew up in Hamburg, New York and Justin in central New Jersey. While they have a number of special memories from their time together at AU, one of Lisa's favorites is from eight years ago this month. "During 'Snowpocalypse' in February 2010, my computer hard drive fried in the middle of the blizzard, but I had a couple of time-sensitive assignments despite the fact that the school was closed. The shuttles weren't running. He [Justin] lived in the Berks, and I lived in a house between the Van Ness and Tenleytown metro stations. He walked through the blizzard to bring me his computer so I could finish my work. He literally weathered a blizzard for me." Just over seven years after the pair's first date, Justin proposed to Lisa after spending the day moving into a new apartment together. "We got home from dinner and decided to check out the night time view from the balcony and he finally proposed. I don't even remember saying yes because of the tears of happiness," recalls Lisa. When it came time to begin planning their wedding, they knew they wanted AU to play a role. In fact, AU played a very central role. 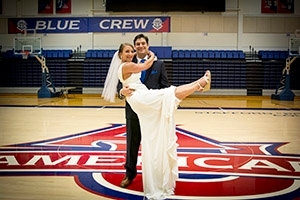 Lisa wanted to recreate a favorite cheerleading photo as husband and wife, and from there came an even bigger idea-to hold the wedding on campus. On August 5, 2017, that's exactly what they did. The AU bond in Lisa and Justin's relationship is quite clear, and they look forward to how these ties to alumni family will play a part as they continue to grow together in this next stage of their relationship. "We are a few years away from having kids, but I've already helped friends connect with babysitters by using my connections to the current Spirit program. When I was a part of the program, a lot of my teammates made connections with alumni through babysitting that turned into internship and job connections, and I hope to do the same," says Lisa. Did you too meet your partner while at AU? Share your story as a part of our annual AU Sweethearts Social Media Project! You can submit your story at alumniassociation.american.edu/ausweethearts18 and share your photos on social media using #AUSweethearts.